First I uploaded J.M.’s raw DNA results to GEDmatch under my own account and used a pseudonym for her name – Kittys2nd1rJM – which makes it clear to me who she is. Plus anyone who matches her will understand that she is my 2nd cousin once removed. Then I waited until the next day. On that next day I clicked on the tier 1 function “Matching Segment Search” and got a form where I had to fill in her kit number (your kit numbers are shown in the third box in the left hand column on your GEDmatch home page). I used the defaults for the SNPs and the cMs. Next I checked the No box next to the “Show graphic bar for Chromosome?” in order to make it easier to copy the results to a spreadsheet. Then I clicked submit and went to the kitchen and made myself a salad. I still had a bit of a wait on my return. Once the matching segment report completed, I used control-A to select the entire page. Then control-C to copy it to my “clipboard.” I opened my spreadsheet program, OpenCalc from OpenOffice, and pasted (control-V) that data into a new sheet. There were a bunch of extra lines at the top which I deleted as well as two extra lines at the bottom that I deleted. Now I moved the name column to before the chromosome column and I changed the column sizes as needed. I added an initial column for “side” where I will put M, P, or I for maternal, paternal, or IBC (false). Then I add several columns before the email column. One for the company I got the match from, one for the most recent ancestor(s) (MRCA), one for the relationship, and another for notes. These days I mainly use notes for who else matches here. Here is how that looked. 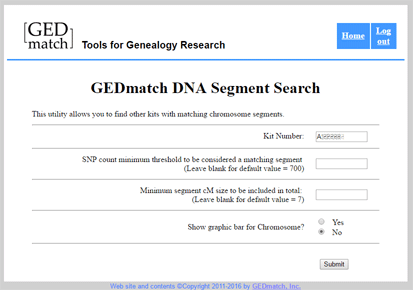 If you DO NOT have other known relatives at GEDmatch, you can skip this next step… I sorted the spreadsheet by the match email address and name and searched for my own email address. Then I added the known MRCA, side, and relationship for all the kits I manage. I also added the same for other known Munson cousins on her list. Then I bolded the names of all the known relatives. Next I ran a one-to-many report for her kit and looked through her top matches. My family members were matches 1-5 but there was a new match, Naomi, with an M kit number, so a test from 23andme, at position 6. I also spotted a group of the 3rd cousins descended from Neils and Martha Simensen previously found at Ancestry in the top ten, because the email address username was the same as the username at ancestry. So I added the common ancestors and presumed relationship (3C) to all those kits in J.M.’s master spreadsheet, found by searching for the email. I also checked the other matches that had a gen of 4.5 or less that were kits from Ancestry (kit numbers starting with A) by searching for the name listed or nickname or the username in the email address. Found several of them at Ancestry . Added those relationships where known. Finally it was time to put the master sheet to work on that Naomi match. I sorted the sheet by chromosome and start position. Then searched through the sheet for Naomi to see if there was anywhere that she overlapped with known relatives. Look what I found. She overlaps both my 3rd cousin DM (JM’s 2nd cousin) and the Simensen group for a really solid 17cM match at chromosome 19. Since DM is from J.M’s mother’s side and the Simensens are from her father’s side, Naomi should only match one group or the other. A quick one-to-one with DM and one of the Simensen crowd settled the matter: Simensen. 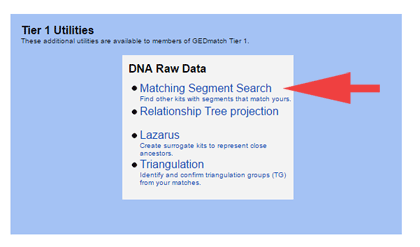 I checked Naomi’s kit number at GEDmatch to see if she had uploaded a tree (click here for that post) but no luck; so I sent her an email with my findings. I will be continuing to use this process with J.M’s other close matches. By the way, I have a template for DNA segment matches that includes the centromere locations in my downloads area. Another thing you can do with master spreadsheets is to map the DNA of an ancestor. See the one I did for my Wold ancestors. Hoping to do the Munson side soon! Thank you J.M, your results are a delight to work with. Either Gedmatch or Excel changed something and now the variable length of the color is lost. Any idea why that happened? Also, is the Gedmatch team eventually going to support .csv, xmls,, or xls versions of its output reports? would that not be cool! Ancestry caters to the people who want the benefits of DNA testing with much less work. The tree matching is wonderful. It is possible to use that, the ‘in common with,’ and circles to accomplish the goals of the less intense genealogists. I am grateful to their TV ads which have brought many new testers in and I accept their limitations. Where is the conference? I would love to join. I have a new first (half) cousin on Ancestry.com, neither of us knows our father. After uploading our raw data onto GEDMATCH, it looks like we maybe half sisters! And that is very exciting news for you! Have you joined DNA detectives at facebook? Have you been to DNAadoption.com and looked through their materials? Oh how I wish I understood all this stuff. I am doing well to simply find any trace of ancestors through my DNA tests. There is not a lot of living relatives that can give me the insights I am looking for when it comes to the secrets in our past relatives. I still haven’t figured out how to use any of the chromosome information & the language used in genetics is foreign to me. Are there any books that break things down in beginner format; like terminology definition & what it means to what we are doing & directions on how to decipher. Something like a do step 1 first, then do step 2, etc. I use Excel in a similar way with the addition of a bar graph for GEDmatch Matching Segment. It takes a few seconds to copy and paste an Excel formula and you have a bar graph of each of the matches. How do I share this very long Excel formula with other Excel users? Could you post me this formula please, and I’ll ask my IT son if he can show me how to add the graphic bar with this formula. I have some cousins would like me to do this table with the graphic bar for them. The matching segment tool says it shows a list of your “closest” matches, but then why are the cM’s for each matching person on the low side? I’ve been using the “People who match one or both” tool and then the one-to-one to verify who matches who and on what chromosome segment. Match 2, must match 3, 4, 5, 6, match 3 must match 3,4,5, 6 and so on and keep. Is that the same as triangulation? I don’t understand the Triangulation tool either, but in my mind I’m doing the same thing? Why would a male have an X match? Thank you for your reply. It kind of threw me off seeing a male with an X. I think he was the only male that did. Cutting that down to “F.D. (by Someone11), 3rd – 4th, Extremely High” putting that in the first column. Next I put all the matches to that person, in the following columns. When I have enough matches I allocate a column to group matches numbering each group of matches. Finally a column for notes. Long winded I know, especially when Ancestry could do the job, with a little effort. When I do the matching segment search, none of my closest relatives show up, though they display the proper results in other searches (my mother comes up with the expected cM relatedness, etc). I think I followed your instructions correctly. It has been about 2 days since I uploaded these datasets from Ancestry. Maybe I need to wait longer?